A delicious way to add vitamins, calcium, and iron to your diet! Produces mild tasting, "miniature cabbages" in autumn. A must for every vegetable garden. Excellent for flavoring a variety of dishes. Delicious when lightly steamed and covered with cheese sauce or melted butter. An excellent source of vitamins and minerals. Wash fruits, vegetables and herbs thoroughly before eating. Plant in a reliably sunny spot. Space plants 18" x 30" (45cm x 75cm) in fertile soil. Keep soil moist, watering freely in dry weather. 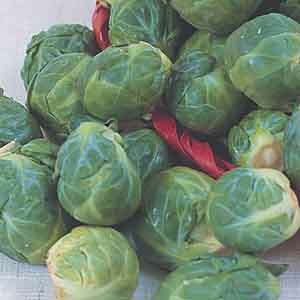 Harvest sprouts when firm.